SportsPlay, a sport-matching app that helps discover sports partners in a wide range of sports has recently announced the acquisition of Jogo to bring forth a singular sporting app to provide a better platform experience than before. With their services ranged around similar premises, Jogo is considered a competitor as well as a suitable partner to SportsPlay in support of providing local sports fans with a smoother platform to enhance their playing experience. Details of the transaction were not disclosed but assets acquired by SportsPlay includes Jogo’s smart booking system, league management system, sports facilities management system and its current users base. Pro-acquisition, these Jogo-related assets and businesses will also be rebranded and merged into SportsPlay as one business entity and SportsPlay will also reach an undisclosed 7-figure valuation. Both startups were founded around the same time back in June 2016 and share the same mission of providing a solid solution for current sports businesses which still faces a lot of offline challenges. SportsPlay is a mobile app that connects users interested in a variety of sports, working through matching users with other individuals who are on the lookout for players to join in on a match in addition to the function of finding sports venues within nearby vicinity. The app currently has over 10,000 users signed up with more than 30 facilities partners on board nationwide and received initial funding from TinkBig Venture. In addtion to individual users, SportsPlay also aids sports facilities in addressing off-peak hours where court utilization can prove to be a challenge. On the other hand, Jogo allowed users to book sports courts through its mobile app and gave court operators the opportunity to manage their sports venue through an easy-to-use dashboard. 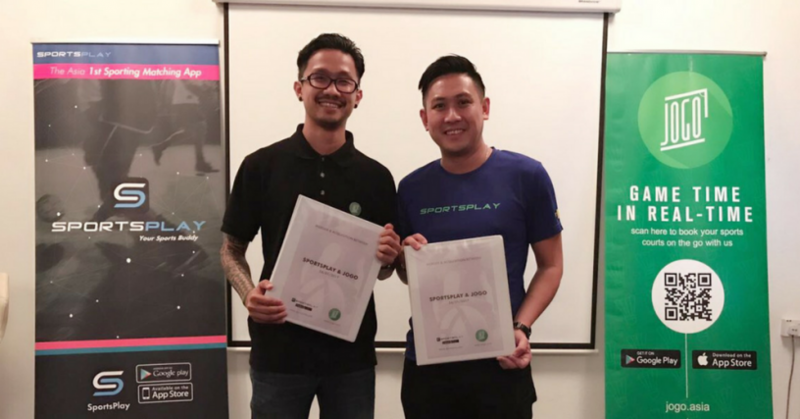 The platform was involved in several local leagues in Klang Valley and helped to manage them through their league management system. “Both companies wanted to solve problems in sports but our solutions came from different directions and different angles. We noticed that we needed some extra solutions to grow stronger, bigger and faster. So SportsPlay decided to acquire Jogo to put everything under one roof and come out as a more solid solution,” said Jin. Since Jogo will be rebranded as SportsPlay, their existing users will be directed to that app instantly. Those already using SportsPlay will see no drastic change but the platform will have more features alongside more new members.